PURPOSE: The Oxford Shoulder Score (OSS) is a robust and universally utilised shoulder score that has been translated for use in Western and Asian countries. This study aimed to translate, cross-culturally adapt and psychometrically validate the Afrikaans version of the OSS for use in Africa. METHODS: Translation and cross-cultural adaptation was performed in accordance with guidelines in the literature. One-hundred-and-eight consecutive patients with either degenerative or inflammatory pain of the shoulder were prospectively enrolled. 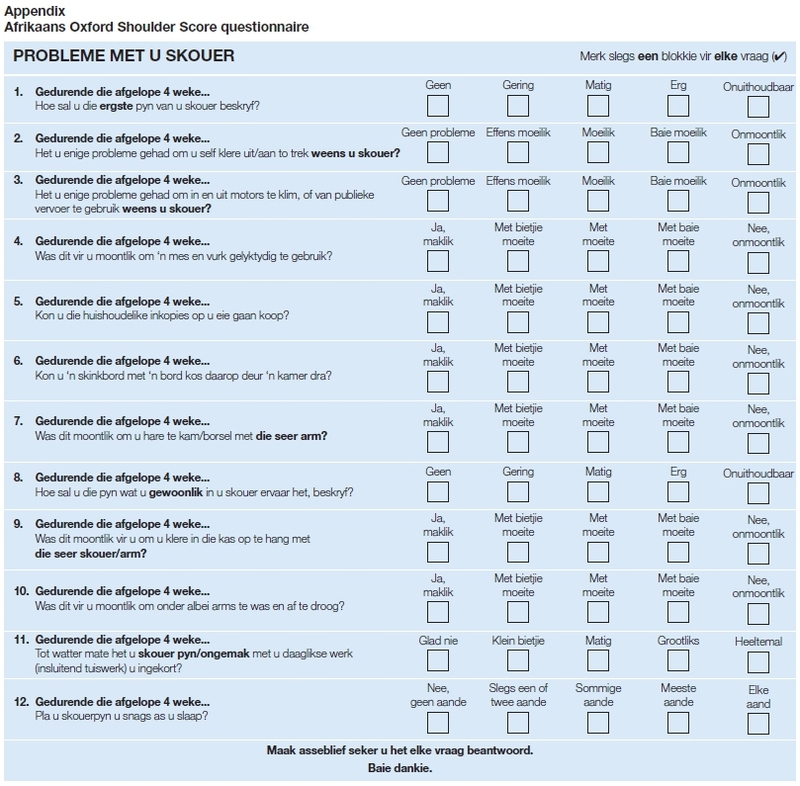 Patients were evaluated by completing the Afrikaans OSS, Constant-Murley, quickDASH, and the Subjective Shoulder Value (SSV) scores. Comprehensibility and acceptance, as well as any floor or ceiling effects, were calculated. Reliability was assessed through reproducibility. Internal consistency was assessed using Cronbach's alpha. Validity was determined using a Pearson correlation coefficient between the Afrikaans OSS and the other validated shoulder scores. RESULTS: Comprehensibility and acceptance were excellent, and no floor or ceiling effects were observed. Reproducibility (r=0.99) and internal consistency (Cronbach's alpha = 0.93) were both excellent. 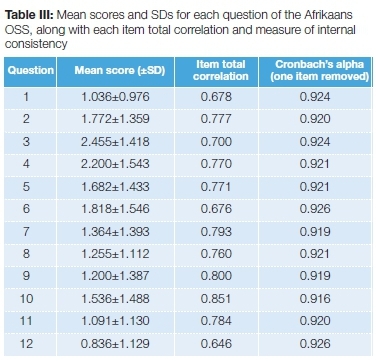 Correlation of the Afrikaans OSS with the Constant-Murley and quickDASH was excellent (r=0.84; r=0.81 respectively), and very good with the SSV and Visual Analogue Scale (VAS) pain score (r=0.73; r=0.66). CONCLUSION: The Afrikaans OSS proved understandable, acceptable, reliable and valid. It is an appropriate instrument for use in Afrikaans-speaking patients with shoulder pain from degenerative or inflammatory origin. 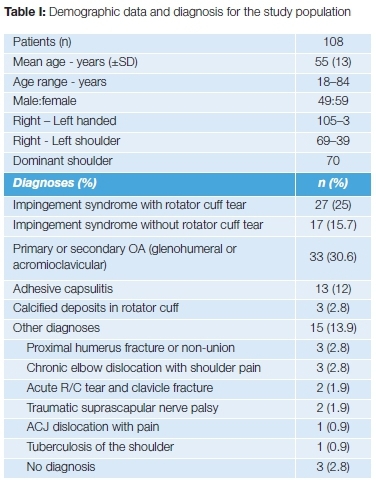 With specific reference to shoulder pain, the Oxford Shoulder Score (OSS) is a joint-specific patient-reported outcome measure (PROM) to assess patient perception about their shoulder pain and its effect on their quality of life. It has been translated into and validated in numerous European and Asian languages,6'6,8-13 reflecting its robustness and universal acceptability. It is yet to be translated into and validated in any African language. Afrikaans is the most spoken language in the western half of South Africa, with 60% of the Western Cape population speaking it as a first language, and the total number speaking it totalling almost seven million people.14,16 With increased emphasis on randomised controlled trials to provide adequate answers to clinical questions,16 and the difficulty in acquiring sufficient patient numbers without multicentre international collaboration,17 the aim of this study was to translate and cross-culturally validate the OSS into Afrikaans to enable appropriate assessment of our patient populations' shoulder pain, and increase its universal applicability. The study was conducted in three distinct phases. The first phase involved the translation of the OSS, followed by a pilot study, run to assess comprehension and suitability of the translated questionnaire. Lastly a definitive prospective trial was undertaken. Translation was performed in accordance with guidelines in the literature.16,18,19 Due to the wide variety of dialects spoken among the various ethnic groups, emphasis on understanding and simplicity of concept over grammatical correctness was requested. Three bilingual speakers independently translated the OSS into Afrikaans. Each person had a medical background and at least a university level degree of education. A single translated version was then agreed upon by consensus decision. Three different translators then back translated this version into English. Following this, a final version was agreed upon, again at consensus, which matched the original version of the OSS (Appendix - see end of article). The translated OSS was piloted on ten consecutive bilingual patients presenting to the upper limb outpatient clinic with shoulder pain. Comprehension of 11 of the 12 questions was perfect. One question required adjustment of one word to a more colloquial form to facilitate easier understanding. 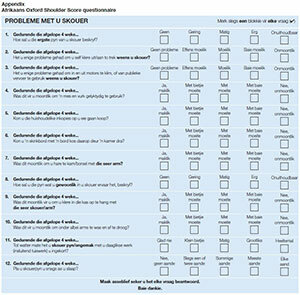 All patients completed the questionnaire in less than six minutes and none described the test as difficult or onerous. A total of 108 consecutive patients were prospectively recruited via the upper limb outpatient clinic of a tertiary care hospital in Cape Town, from July to November 2016. Patients were included if they were over 18 years of age; were able to read, write and speak both English and Afrikaans; and had shoulder pain arising from inflammatory, degenerative or post-traumatic causes. Patients with shoulder pain from instability, as well as literacy and language difficulties, were excluded. 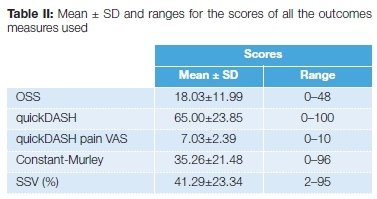 Each patient first completed the translated OSS, followed by the quickDASH20 (which had a Visual Analogue Scale [VAS] pain score included), Subjective Shoulder Value (SSV)21 and Constant-Murley Shoulder Assessment.22 The clinical assessment of the Constant-Murley Score was administered by a single researcher, under the guidance of and following a training session with the head of the Shoulder Unit. A VAS score, rating pain level with activity, but not specifying the duration, was also recorded with the quickDASH. The scale was from 0 (no pain) to 10 (worst pain). Comprehensibility and acceptance were assessed by compliance via the number of questions answered or omitted. No more than two questions may be omitted for the questionnaire to be valid, and if any single question had two or more answers, we adhered to the convention of adopting the worse score for recording.23 The time taken for the patient to complete the OSS was recorded. Floor and ceiling effects were also determined to assess whether there was any bias introduced at the extremes of the scores.19 If more than 15% of the respondents achieve either the highest or lowest score, these effects are present.29 This limits content validity, as discrimination is lost at the limits of the scale. Internal consistency was determined by calculating Cronbach's alpha. It defines the correlation between all the items within a scale.8 Values may range from 0 to 1, with 0.90-0.95 optimal for clinical application.33 Values above 0.95 indicate items are too similar and may be redundant. The institutional Human Research Ethics Council gave approval for the study (HREC reference number 457/2014) and it was conducted in accordance with principles in the declaration of Helsinki (2013). Each patient gave written, informed consent prior to being enrolled. No major discrepancies were noted between translators in either the forward or backward translation of the OSS. Consensus agreement was reached easily. All 108 patients who met the inclusion criteria participated and completed the questionnaires. Demographic data and pathology were recorded and are outlined in Table I.
Thirty-nine patients were pending planned surgery, 40 patients post-surgery (not within six weeks post-operatively) and 29 patients were being managed conservatively with no scheduled surgery. No patients reported any difficulty with comprehension. Acceptance was excellent with all patients answering all the questions for the OSS, and only one patient omitting one question for the quickDASH. The mean time (min:sec) to complete the OSS was 4:09 (standard deviation [SD] ± 1:12). Overall absolute values, mean scores and the ranges are given in Table II. In the OSS dataset, the lowest possible score is 0 and the highest possible score is 48. Seven respondents achieved the lowest and only one achieved the highest, totalling 7.4% of all respondents. No floor or ceiling effects were thus present. The test-retest reproducibility for the 40 patients was very high (r=0.99). The mean difference between the questionnaires was 0.2 points (95% CI -0.31 to 0.43). The internal consistency was also high (Cronbach's alpha=0.93). Single question elimination did not drop the value significantly, with all items correlating (item total correlation > 0.65) (Table III). 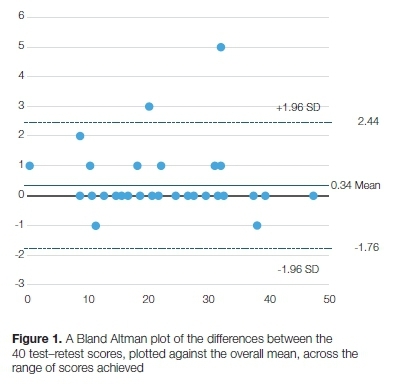 A Bland Altman plot was calculated to indicate the differences between the test-retest scores, as plotted against the overall mean and across the range of scores (Figure 1). Pearson correlation coefficients calculated between the Afrikaans OSS, the Constant-Murley, and the quickDASH were excellent (r=0.84 and 0.81 respectively), and very good for the SSV and the VAS pain score (0.73 and 0.66 respectively). The mean time taken to complete the OSS (4 min 9 sec) was slightly longer than in other translations.8-10,12 This may reflect the patient population that we serve, for although the inclusion criteria mandated that patients were bilingual in both Afrikaans and English, many have only had access to a basic education possibly resulting in more time to read and complete the questionnaire. The psychometric properties of the Afrikaans OSS were excellent across all measurements and compared favourably with other validation studies. The test-retest reproducibility was very high (r=0.99), and the internal consistency was excellent (Cronbach's alpha=0.93), indicating the translated OSS is reliable (Table IV). By correlating the translated OSS with the Constant-Murley, the quickDASH, the SSV and a VAS pain score, construct validity was determined. All the comparative outcome scores are reliable and widely accepted outcome scores, and correlations between each were either 'very good' or 'excellent', demonstrating good construct validity. The Bland Altman plot of the differences against their means indicated no systematic bias across the range of scores. The English (data from original paper), German, Italian, Dutch and Korean translations used the older OSS scoring system, while the Chinese and Turkish have adopted the newer, more intuitive scoring system. Absolute values for the scores give an indication of the severity of the patient's perception of their shoulder problem. With simple mathematical conversion, the standardised scores for comparison are given in Table V.
The mean score for the Afrikaans patients is at least 4.6 points below the mean of the lowest scoring population group compared. This is equal to a minimal clinically important difference for the OSS.23 Reasons for this difference are likely to be due to access and our patient population. Low-income populations generally have inferior access to healthcare services. Patients often only seek help when it is direly needed due to prohibitive transport costs and long waiting times. This may result in perceived and 'real' differences in their shoulder pain, both from patient desperation for assistance with their shoulder and disease progression. There are some limitations that merit discussion. Our patient cohort is only from a single centre. Although our drainage area is broad and encompasses a wide spectrum of Afrikaans dialects, it will not have included them all. Secondly, unlike many other studies that translated the OSS into their native languages,5,8,9,11,12 we chose not to use a generalised health assessment questionnaire when assessing construct validity. Although shoulder-specific pathology may not necessarily have direct impact on overall patient function and wellness,5,10 this would not reflect in our study. Lastly, we did not include a measure of sensitivity to change within the questionnaire, which would have aided assessment of responsiveness. The Oxford Shoulder Score has been translated, cross-culturally adapted and validated into Afrikaans in this study. The questionnaire was easily comprehended and completed by all patients. Measures of stability and validity were robust in statistical analysis, with excellent internal consistency and construct validity in comparison to other shoulder outcome scores. The authors wish to thank Karin Wiese, Francois Meyer, Toni Kriel, Narette Botha, Jani Ferreira and Theodi Albrecht for their assistance with the forward and back translation of the questionnaire. Ethical approval: The Human Research Ethics Committee (HREC) of the University of Cape Town approved the study prior to its implementation: HREC number 457/2014. A copy thereof is available from the corresponding author if required. All procedures performed in this study were in accordance with the ethical standards of the 1964 Helsinki declaration and its later amendments. Funding: This study did not require funding. Conflict of interest: The authors declare they have no conflicts of interest.